Deluxe Garden Glider. Dimensions: 71"H x 44"W x 94"L. Must Ship Motor Freight. The quality mechanism in these gliders ensures smooth and quiet movement. 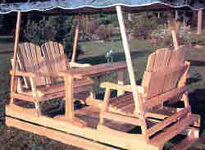 The Deluxe Glider is a great place for a quiet game of cards or iced tea on a sunny day. The Deluxe Garden Glider comes with a cheery blue top with a green leaf print. Center table is removable for convenience.